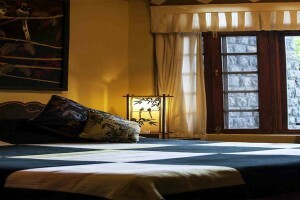 Use the form below to inquire about Quaint Homestay at Kangra . 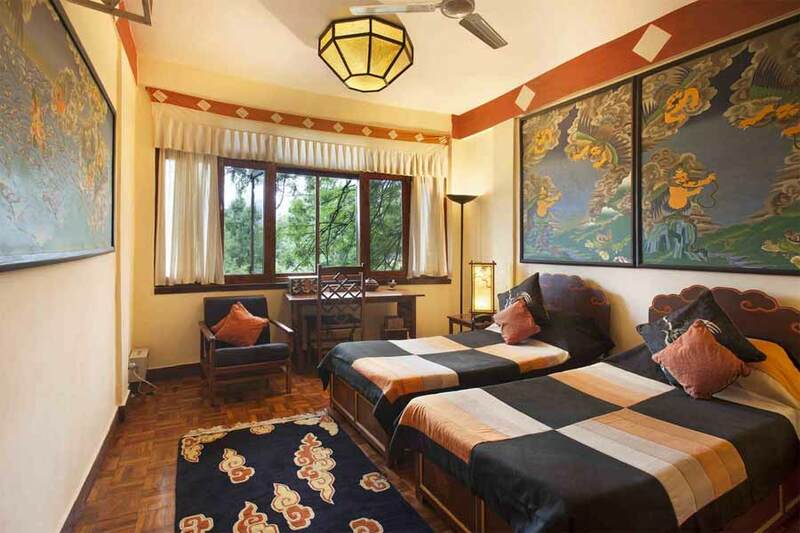 Use the form below to reserve for Quaint Homestay at Kangra . 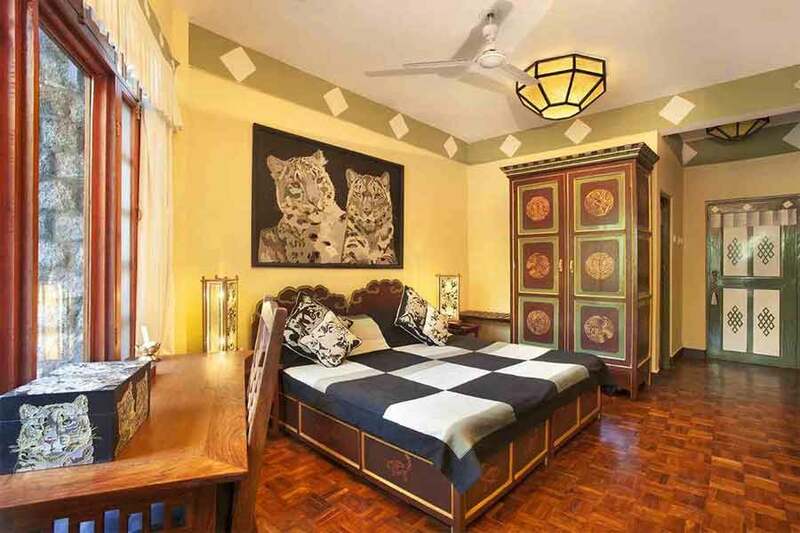 Located on the ground floor this room has two twin beds which can be converted into a king. It also has an attached terrace. Located on the ground floor, this room has two twin beds which can be converted into a king. It has an attached balcony. 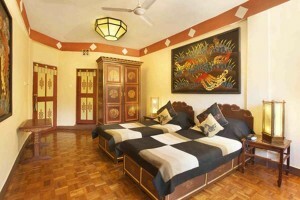 Located on the first floor, this room has two twin beds which can be converted into a king. 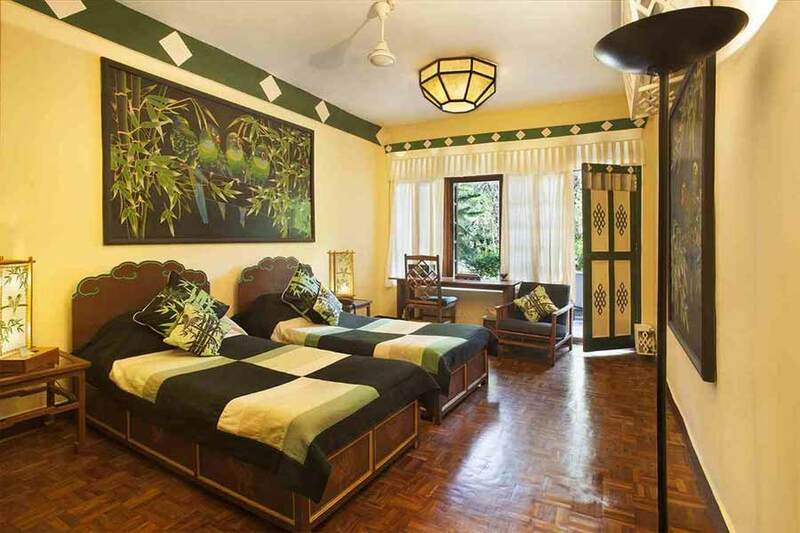 Tastefully decorated rooms with exotic names greet you at this Quaint Homestay at Kangra surrounded by lush gardens. Nestled in the foothills of the Dhauladar mountain range, this cozy homestay with its Japanese-style gardens offers a secluded haven for some relaxation and rejuvenation away from the din of city life. Kangra is situated a short drive from Dharamsala, the headquarters of the Tibetan government-in-exile and thus, has a substantial Tibetan population. Known as the most picturesque valley in the lower Himalayan region, Kangra is a slice of verdant greenery. The specialty of the rooms in this Quaint Homestay at Kangra is the handcrafted furniture which offers you fine examples of Tibetan tradition. 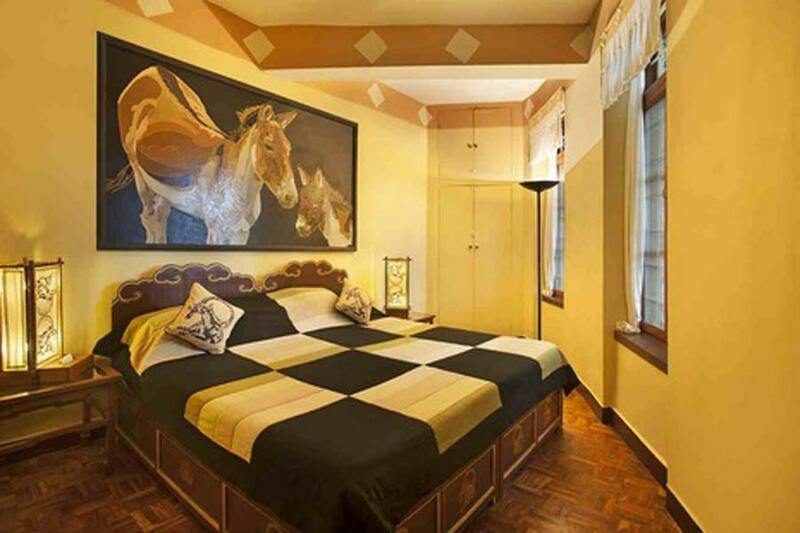 The artwork that makes up the decor of the homestay also resonates the rich Tibetan culture that the region abounds in. Spend an hour or two every day, simply gazing out at the stunning landscape visible from the many windows of your comfortable room. The rooms here are themed around animals from Tibetan mythology. 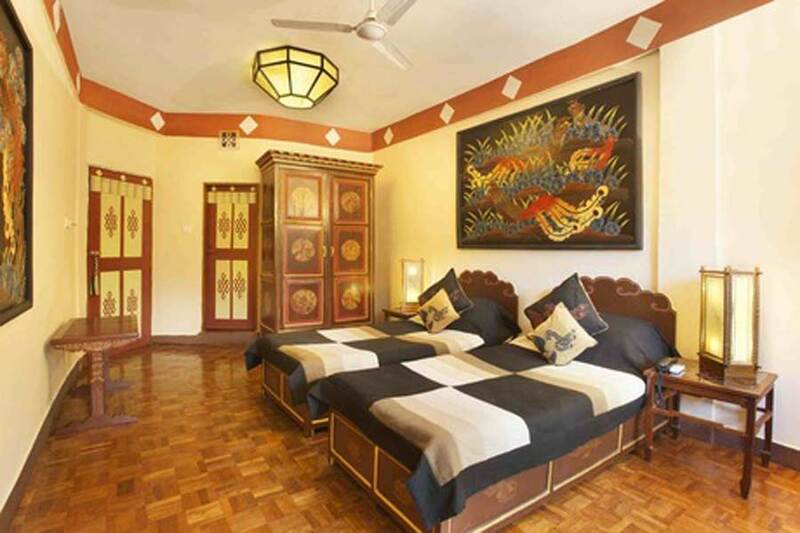 Thus, the Suite Rooms are named Tiger, Ibex, and Dragon while the Superior Rooms are Bird, Parrot, Snow Leopard, Sea Monster, Snow Lion, Garuda, Fish, and Phoenix. 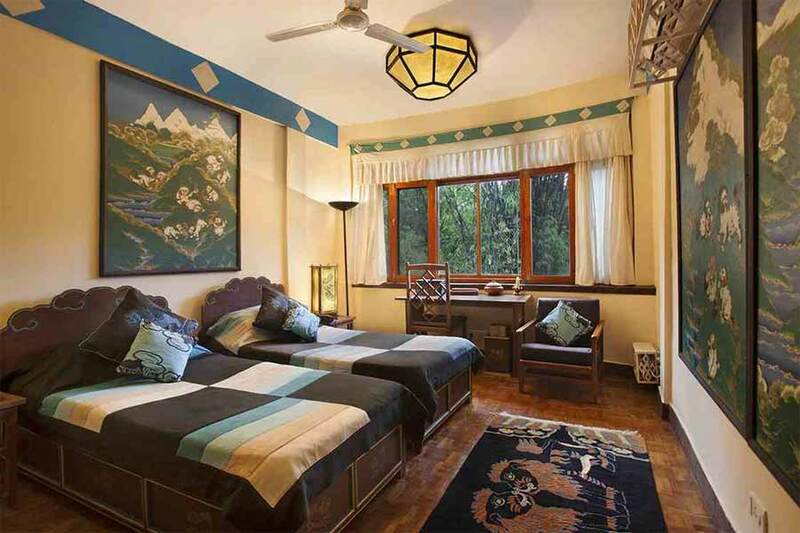 You can enjoy traditional Tibetan hospitality at this quaint homestay at Kangra without having to forego any of the modern amenities that you are used to! 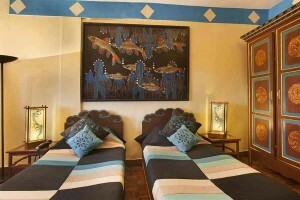 All rooms are non-smoking and are equipped with air conditioning and heating, a minibar, free wi-fi, hot water thermos, and complimentary tea bags. There is a vegetarian restaurant on the property which serves a variety of healthy international cuisine for breakfast, lunch, and dinner. Choose from thupka, hummus, pizza, pita bread, juices, and smoothies which are some of the items on the menu. You can seek assistance from the helpful staff here if you require transportation or guides to help you explore the area. Nature walks, trekking trips, and visits to the many monasteries in the area are some things you might find interesting. If you fancy yourself an artist, you might want to sign up for a workshop on Tibetan art also. Extra person will be chargeable. 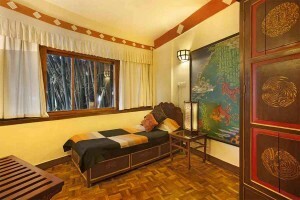 Room rates are subject to change without notice and cannot be guaranteed. 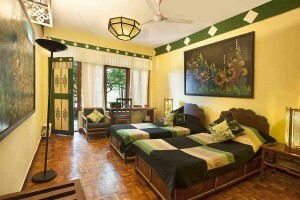 Above double occupancy will be charged at 25% of room rate. Please note that if your booking is cancelled, but then your room is booked by another person, you will be refunded your full deposit. Also note that each day of the booking is considered individually, so if you cancel your booking and some of these days fall under one cancellation rate, while some fall under another, you will be charged the appropriate rate for each day. In case of cancellation of individual rooms from 30 days to 15 days before the check-in of the booking, the hotel reserves the right to charge the individual 40% of the total bill (inclusive of taxes) as retention. In case of cancellation of individual rooms from 14 days to 10 days before the check-in of the booking, the hotel reserves the right to charge the individual 50% of the total bill (inclusive of taxes) as retention. In case of cancellation of individual rooms from 09 days to 05 days before the check-in of the booking, the hotel reserves the right to charge the individual 60% of the total bill (inclusive of taxes) as retention. In case of cancellation of individual rooms from 04 days to 02 days before the check-in of the booking, the hotel reserves the right to charge the individual 80% of the total bill (inclusive of taxes) as retention. In case of cancellation of individual rooms from 1 day before check-in or an eventual no-show, the hotel reserves the right to charge the individual 100% of the total bill (inclusive of taxes) as retention. There is plenty of exploration for travel enthusiasts and adventure-seekers in and around Kangra. Kangra Fort built by the Katoch Dynasty is one such place while Masrur, with its 10th century or earlier rock cut temples makes for a great day trip if you are a history buff. A climb to the top of the temple will provide you a splendid view of the majestic Dhauladar range. There are plenty of temples and monasteries for those seeking some spiritual enlightenment and peace of mind. Gyuto Upper Tantric College and Dolmaling Nunnery are two such places where the chants are sure to transport you to a world of your own. 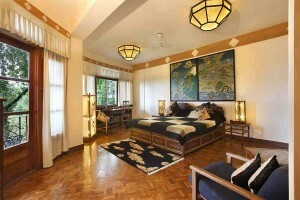 The Tibet Museum is extremely informative and provides insight into the life and politics of the Himalayan nation. Kareri Lake is a favourite with trekkers while thrill-seekers can go parasailing or paragliding, soaring over the treetops. Set apart one day to explore Palampur, Baijnath temple, and Taragarh Palace to your heart’s content. Another addition to your list could be the Tatwani hot spring which is supposed to have plenty of medicinal properties. Gaggal airport in Dharamsala is the nearest at 14 kms (appx 30 mins) away. Weather plays a crucial role in determining when flights can land at this airport. The closest major train station is Pathankot which is about 85 km (appx 2 hrs) away.